This is the category for the Kurdistan Workers' Party, PKK, a militant organization in Turkey. 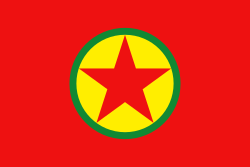 current flag of the PKK, since 2005. Pages in category "Kurdistan Workers' Party"
This page was last edited on 27 October 2017, at 04:09.